These burritos are a touch spicier than my steak tacos and even come with indoor cooking instructions! Now I can get my steak taco/burrito fix year round! Place the steaks into a gallon sized zipper bag. Whisk together the marinade ingredients and pour over the steak. Close the bag and massage the marinade into the steaks. Leave on the countertop to come to room temperature and marinade for 30 minutes. Alternately, refrigerate overnight, removing the steak from the fridge 30 minutes before cooking. Grill (or cook in a skillet), reserving the marinade, the steaks over medium heat, flipping once, until done. Set the steak aside for 10-15 minutes. Slice steak into thin pieces. Place the steak in a skillet over high heat along with the reserved marinade. Cook for 2-3 minutes or until the steak is heated through and the marinade is reduced. Fill each tortilla with steak, rice, and beans. Serve with guacamole and sour cream. 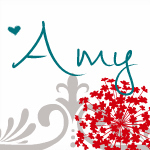 Hi Amy...first of all I love your photography! and now to the burrito, it looks so good! I love to see the use of whole pinto beans vs the re-fried type we see in most recipes! Thank You for sharing. I came over to visit you from Nap time Creation's party.